This is another attempt at getting our boy Kane pictured as GSD of the month.... I just love this pic of him. The last time we entered the contest he was only 7 1/2 months old. Now a beautiful almost 2 yr old sweetheart, the attached pic show he's still a barrel of laughs. Poor guy didn't make the mess, his sisters did but he got caught enjoying the after math of their ripping the feather mattress to shreds. 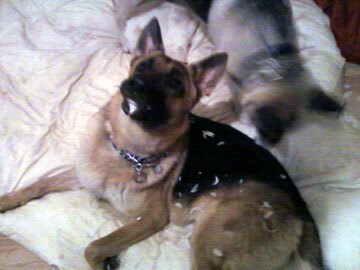 Thanks so much for sharing that lovely picture of your little feather duster, your German Shepherd Kane. He is absolutely gorgeous. Keep sending those pictures and stories in of your big boy. I never get tired of reading about other peoples experiences and life with their own German Shepherds. They are all so different - yet so alike too, It is a priviledge that I never grow tired of. And I'm sure our other reader feel the same too. So, to all of you readers out there, I encourage you to share the story of your own German Shepherd too. White, black, saddleback, mixed - we don't care but we would love to hear how your life has been impacted by this lovely breed of dog, my favorite, the German Shepherd Dog. What a good loolking 2yr Shepherd! He must have a beautiful baby too! He is so lucky to have a loving home with great family members. Hope he wins and I need to enter Mia my beautiful shepherd, she is something else too! Take care of your boy and he will take care of you! Hi! Angela, Thank you for sharing your story of your German Shepherd, Kane. I love your photo that you submitted. He is such a sweetheart. I hope he wins.